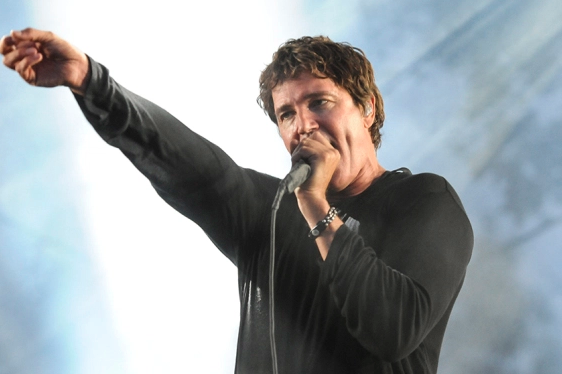 Third Eye Blind performs Sunday, June 25 at Festival Pier. The other day, on the occasion of his induction into the Songwriter’s Hall of Fame, JAY Z graciously shared a barrage of tweets spotlighting some of his inspirations. These weren’t just household rap legends, but also insider mentions of indie and underground favorites getting some unexpected shine. Amidst the names was Digable Planets’ Ishmael “Butterfly” Butler, an auteur rapper/producer who, after carving out a footprint as an alternative hip-hop hero as one-third of Digable, has since pushed into avant-garde territory with his Seattle group Shabazz Palaces. But it’s Digable that set the stage, and with roots in Philly, the celebrated outfit is a frequent fan favorite around town. A few years ago, over the course of a couple albums, the Scranton band Tigers Jaw shrunk from five members to two. That they stayed together at all is a testament to the resolve of the remaining duo, who, despite their diminished numbers, have grown the band into a major label affair. Their new album, last month’s “spin,” calcifies the band’s sound like a proper, formal introduction. Even if they’ve been strumming tunes for more than a decade, it feels like Tigers Jaw has finally and fully arrived. Lindi Ortega’s new music took shape as she moved from Nashville back to Canada, from her adopted artistic home back to her birthplace. Even though her new EP was recorded in Nashville, you can hear the move in her streamlined sound, no longer so explicitly country and instead more broodingly folksy. It’s a change of pace precipitated by Ortega nearly giving up music for good. That she’s trying new things after releasing several albums is a move in the opposite direction, a signal that maybe she’ll never stop writing or singing at all. A trio of headliners joins forces at the Wells Fargo Center this weekend to conjure up some ‘80s teen nostalgia. Long before the boy band became a brief standard in pop, New Kids on the Block helped pioneer the format in the mainstream. Boyz II Men offered a different take, infusing their music with expert doo-wop and R&B harmonies that forever set them apart as local legends in the same space. Embattled in controversy but forever lionized by his fans, R. Kelly is one of R&B’s most divisive figures. The raunch of his music has become impossible to separate from the allegations of abuse that have plagued his career. But the Chicago icon has left behind a trove of classics that span decades: the smooth sounds of his ‘90s work bled into the boisterous pop of the aughts. At his best, Kelly is a dramatic story-teller and nimble crooner. Twenty years removed from its release, it’d be hard to explain to a kid in 2017 how big a deal Third Eye Blind’s debut was throughout the summer of 1997. It’s life on radio—you could reliably tune your dial to ”Jumper” or “How’s It Gonna Be” at any waking moment—bled all the way into the band’s second album, and Third Eye Blind became icons of the tail-end of the ‘90s as a result. These days, even when they’re releasing new music, the group runs on a certain measure of nostalgia for those simpler times, which is good news for any fan seeking out those original hits.